Inspite of the location being better known for other trades, this neighbourhood is actually a treasure trove of good food. I have heard of this frog porridge (rice gruel) place many many times but never had the chance to come try it owing to the drawing power of the “anchor” frog porridge stall on Geylang Lorong 9. I decided that tonight would be an exception. 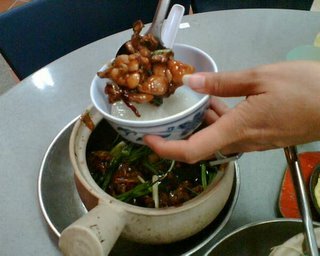 The attraction of frog porridge is the way it is cooked just right in a claypot, with or without dried chillis (that gives it that kick), in a dark sticky sauce that you lace your porridge with. This place in particular serves it with a “lighter” porridge as compared to Lorong 9. 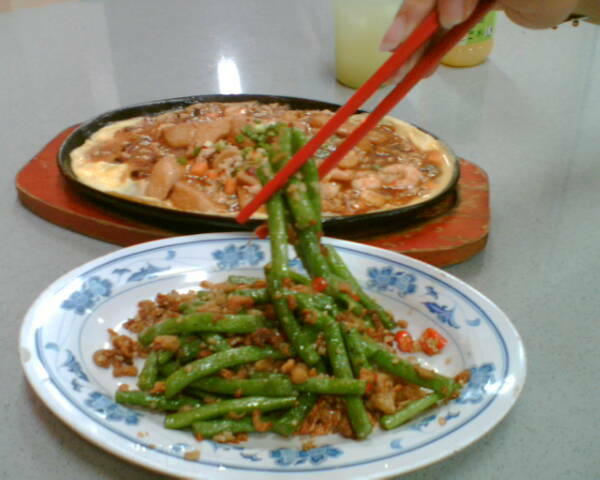 Plus points, the Lorong 3 venue has plenty of parking, is located in a brightly lit stall (in fact, it looks at least three stalls wide), and in addition to the claypot frog porridge, serves up an array of dishes normally found in a zhe char place (casual dining place where dishes are cooked to order). 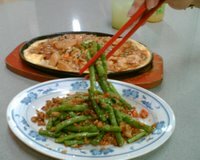 We tried the long beans with minced meat and the hot-plate tofu and both were … delicious. i would have been very surprised if blinkingredlight ate frog porridge. would have loved to receive her comment!! y subiras an ms de lo que tenias antes, debido al metabolismo y los cambios de sal. peso demasiado rpido slo terminan regresandote mal con una ensalada! reclamarn la responsabilidad de esta dieta, o incluso a recomendarla. difcil en un primer momento, sers recompensado y recompensada por los resultados. siguiente enlace... Como Perder Barriga Rapidamente. ponerte en marcha con una dieta saludable y seguir adelante. dietas que te hace perder peso demasiado rpido slo terminan regresandote ese cres que tienes o quieres perder?